Three suicide car bombings struck within an hour and two parked motorcycles exploded in northern Iraq on Thursday, while gunmen in speeding cars opened fire on a crowded market in Baghdad in a series of rapid-fire attacks that killed at least 38 people. Continuing violence during the past days has claimed the lives of at least four children, two U.S. soldiers and a Sunni Muslim cleric, underscoring the rampant, random nature of an insurgency that has killed at least 810 people since the April 28 announcement of Iraq's new Shiite-led government, according to an Associated Press count. 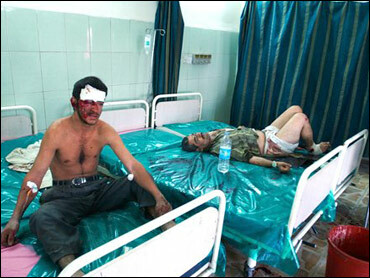 Twenty people were killed as a wide swath of northern Iraq was hit by three suicide bombings within an hour. A suicide bomber struck a restaurant in Tuz Khormato, 55 miles south of the northern city of Kirkuk, during breakfast hours Thursday, killing at least 12 people, including a bodyguard of Iraq's Kurdish deputy prime minister, Rowsch Nouri Shaways, and wounding 40, according to the Iraqi Defense Ministry and police. The blast set ablaze eight cars in the restaurant's parking lot, the focal point of a bloody, rubble-strewn scene that U.S. and Iraqi police quickly cordoned off. Shards of glass, shoes and splattered breakfast meals covered the restaurant's floor as emergency workers raced around overturned tables and wooden chairs in a bid to treat the casualties. Ambulances and pickup trucks ferried bloodied bodies and mutilated corpses away. A new online posting purportedly by the al Qaeda group in Iraq has declared the creation of a new cell of suicide bombers called the "al-Bara bin Malek Brigade," and claimed it has already carried out a number of unspecified attacks. It wasn't possible to verify the authenticity of the four-minute-audio tape by a man claiming to be Abu Doujana al-Ansari, the purported head of the group. The military announced the deaths of three soldiers, including two assigned to the 2nd Brigade Combat Team, 2nd Marine Division, II Marine Expeditionary Force, who died Wednesday. One was killed when a bomb struck the vehicle he was traveling, while the other died from enemy small-arms fire received in combat near Ramadi, 70 miles west of Baghdad. Another soldier, attached to Task Force Liberty, died of non-battle-related wounds Wednesday in Kirkuk, the military said. In a bid to curb Iraq's insurgency, Shiite leaders have been reaching out to Sunni Muslim insurgent groups. But the country's two main Sunni Muslim Arab organizations, angered over the recent arrest of one their leaders and an Iraq-led offensive in Baghdad, threatened not to participate in drafting Iraq's new constitution. At least 700 "terrorists" have been captured and 28 killed four days into Operation Lightning, which involves 40,000 Iraqi soldiers and police, Iraqi Interior Minister Bayan Jabr said. An additional 118 criminal suspects also were rounded up. The operation has angered members of the Sunni community, many of whom fear the crackdown is aimed at them in light of the spate of attacks linked to Sunni extremists. Iraqi police have arrested the brother of an at-large member of the 55 most wanted list of former Saddam Hussein regime figures. Anwar Abdel Karim Abdallah al-Sadun was captured with three other Baathists near Nasiriyah, about 200 miles southeast of Baghdad, local council head Ali Hussein said. He is the brother of Abdel Baqi Abdel Karim Abdallah al-Sadun, the former Baath Party regional command chairman and No. 40 on the most wanted list. In Kirkuk, a suicide car bomber targeting a convoy of Toyota Land Cruisers carrying civilian contractors killed four Iraqi bystanders and wounded at least 11 others, said Dr. Bassam Mohammed of Kirkuk Emergency Hospital. None of the occupants in the convoy was injured, although one vehicle was damaged, the U.S. military said. "My 5-year-old boy Ayad and I were passing by the car bomb exploded and the blast killed him," Robert Jerges, the child's father, said. "Why did I lose my child? why did he deserve this?" Another suicide bomber killed four people and wounded four in Baqouba, about 35 miles northeast of Baghdad, police Col. Mudhafar Mohammed said. The victims included Hussein Alwan al-Tamimi, 41, deputy head of Iraq's northeastern Diyala provincial council since January, and three of his bodyguards. Two parked motorcycles rigged with explosives also detonated near a coffee shop frequented by policemen Thursday, killing five Iraqis, wounding 13 and destroying several shops in Mosul, police and hospital officials said. Gunmen firing randomly from three speeding cars also killed nine Iraqis in a crowded market in the ethnically mixed neighborhood of Hurriyah, northwestern Baghdad, a Defense Ministry official said. "There were no security targets there, they were all civilians," Defense Ministry spokesman Radhi Badir said. "They were shooting randomly, shooting at shops in the bazaar." An announcement released by the Defense and Interior Ministries Thursday said "an armed group in three cars opened fire in the al-Hurriyah district, martyring nine civilians." The massive explosion in Tuz Khormato tore apart the town's Baghdad Restaurant, where bodyguards of Iraq's Kurdish deputy prime minister, Rowsch Nouri Shaways, were eating, police Brig. Sarhad Qadre said. Shaways was not at the restaurant at the time of the blast. Kurds, who want oil-rich Kirkuk to be part of their autonomous Kurdistan region, have been regularly targeted by insurgents. A roadside bomb blast Thursday forced a car off the road in Mahmoudiya, about 20 miles south of Baghdad, killing three passengers and wounding three others, Yarmouk Hospital Dr. Shebab al-Neimi. Militants also attacked an Iraqi police patrol with gunfire and a car bomb, killing a female bystander, plus wounding a civilian and a policeman in Baghdad's southern Dora district, police Lt. Majid Zaki said. Police captured the insurgents, however, and raided a car bomb-making workshop south of Baghdad.